Weightlifting for runners may sound like an oxymoron, but these activities complement each other like peanut butter and jelly. In fact, many of the fastest and most powerful runners competing in virtually any distance regularly incorporate resistance training into their training protocol. Let us take a moment to consider why runners benefit from weightlifting. Running is one of the most efficient forms of cardiovascular activity. Furthermore, also requires virtually no equipment – a pair of decent shorts, socks, and running shoes is all you need to get started. In addition to training your heart, running heavily taxes all the muscles below your belly button. However, the upper body also plays a critical role. If you’ve ever watched elite runners, then you may notice their exceptional upper body posture and ability to use their arms to unlock additional power towards the end of a race. Inefficient runners (such as myself), allow their shoulders to roll forward, chest to dip down, and neck to drift forward as they fatigue. A breakdown of form, compounded by the repetitive nature of running strides, may lead to injuries and depressed performance. Weightlifting builds muscle, improves that awful posture displayed at end of races, and strengthens both tendons and ligaments around your ankle, foot, knees, and hips. If you consider running your primary form of physical exercise, but do not currently incorporate any resistance training, you’re missing out, big time. Resistance training, commonly referred to as weightlifting, can decrease injury risk, improve power during short distance runs, extend endurance during long distance runs, support proper posture, and torch stubborn fat. The schedule below is a sample designed to optimize your running and weightlifting performance. I encourage you to customize this routine based on your goals and physical ability. In short, you should try to schedule enough time between your lower body-dominant workouts and longer or more intense runs so as to maximize recovery. The distances described below are oriented for someone looking to run a 5k or 10k in the near future. Warming up for a run will vary based on the type of run (hills, intervals, sprints, or endurance) as well as the duration. Typically, I warm up by starting at between 50 to 60% of my target pace until my muscles feel warm and blood is flowing to my fingers and toes. I may do some dynamic stretching after a brief warm-up and then will complete my programmed running workout. After the run, I may run a few minutes at a 50 to 60% pace and then perform some dynamic and static stretching. I recommend customizing your weightlifting warm-up based on the target muscle groups you plan to train during that workout. If I’m going to complete a full body workout, then I might perform one or two cardiovascular activities that engage all muscle groups. For example, I may jump rope for three to five minutes and then use the rowing machine for another three to five minutes. If my workout is upper-body focused then I may only use the rowing machine for five to eight minutes. On lower-body dominant days, I stick with jump rope, incline walking on the treadmill, or a seated bike for five to eight minutes. After engaging my cardiovascular system, I perform a series of dynamic stretches and sometimes foam rolling. At the end of my workout, I may perform some yoga or static stretches, although admittedly I need to be better about post-workout stretching. 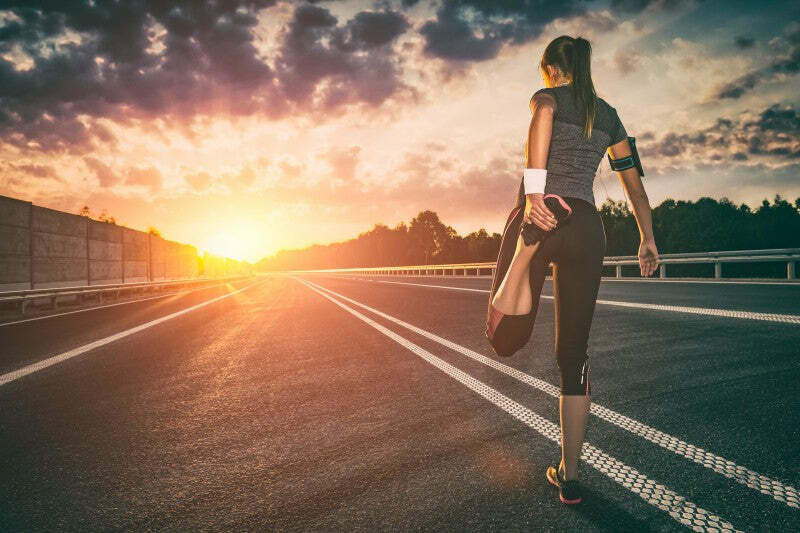 At a high level, progressing on a running workout tends to be fairly straightforward – you run further in the same amount of time or run the same distance in a shorter amount of time. Progressing on a weightlifting routine is also simple, but easier said than done. Adding weight to the bar and/or performing more repetitions with the same weight are the two most common forms of progression. Unfortunately, you may be unable to check one or both of those boxes during every workout. Instead of beating yourself up for not adding weight or reps, you can also progress by improving your form, decreasing rest periods (re: the same amount of work in less time), increasing bar speed, performing more sets, and using intensity techniques such as drop sets and supersets. The first exercise of each workout will be a compound movement – bench, squat, or deadlift. Even if you’re having the worst day, strive to progress on that first movement. Who knows, it may be just the push you need to start feeling better and crush the remainder of your workout. For the sample routine below, we will utilize a Rep Goal progression scheme that incorporates rest-pause training and supersets. Rep Goal – The Rep Goal method, designed by Tiger Fitness editor Steve Shaw, is hands down the simplest and most effective approach for progressing in weightlifting. Prior to beginning the routine you identify a target number of reps (e.g. 30 or 50) that you want to complete over a target number of sets (e.g. 3 or 5). Instead of performing three to five ho-hum sets of 10 to 12 reps, you push yourself on every set, striving to blast through that rep goal target. Once you complete more than the rep goal, add weight to the bar the next time you perform that exercise. For example, if you have a 30 rep goal across 3 sets and perform 12, 15, and 10 repetitions during each set respectively, you would add weight to the bar. Rest Pause – Also known as the Bulldozer Method, rest pause is a great technique for building work capacity, strength, and muscle. After performing the first set of an exercise, instead of resting 60-90 seconds between sets, you’ll start with a more conservative weight and rest just 15 to 30 seconds in between sets. Don’t push the weight on these; you will fatigue quickly towards the end of the rest pause set. Superset – A superset involves performing two exercises back-to-back without rest. The most common supersets involve pairing opposite muscle groups so that you maximize workout efficiency without overly taxing one muscle group. My favorite pairings include biceps and triceps, horizontal pressing and horizontal rowing, as well as vertical pressing and vertical rowing movements. If you’re new to the weightlifting scene then I encourage you to follow the prescribed rest times. While you may feel antsy to rush into the next set, cutting your rest period short could ultimately lead to hindered performance due to increased fatigue. As a general rule of thumb, I rest two to three minutes between compound, multi-muscle movements like bench, squat, deadlift, and overhead press. For smaller single joint, isolation movements like bicep curls, crunches, and calf raises, I rest between 30 to 90 seconds based on the load and whether it’s a rest pause set of not. Between exercises I rest three to five minutes, depending on how long it takes me to un-rack the bar and put away the weights. Flat Barbell or Dumbbell Bench Press. Work up to a top set of 5 repetitions – this should NOT be your 5-rep max (5RM). Drop the weight achieve a 30+ rep goal in 3 sets. Barbell Row. Achieve a 50+ rep goal in 5 sets. Use the bulldozer method with 30 second rest periods. Leg Press. Perform 4 sets of 25 reps. Rest 60 to 90 seconds between sets. Dumbbell Lateral Raises. Perform one continuous set in which you drop the weight used three to five times. Rest as little as possible in between dropping the weight. Add an additional drop once you’ve achieved a 50+ rep goal in 3 sets. Incline Dumbbell Curl superset with Bench Dips. Achieve a 40+ rep goal in 5 sets. Add weight to lap if you can perform more than 40 reps on bench dips using just your bodyweight. Rest 60 to 90 seconds in between supersets. Lying Leg Curls. Achieve a 60+ rep goal in 5 sets. Use the bulldozer method with 20 second rest periods. Warm up for five to eight minutes. Barbell Back Squat. Work up to a top set of 5 repetitions – this should NOT be your 5-rep max (5RM). Drop the weight achieve a 30+ rep goal in 3 sets. Romanian Deadlift. Achieve a 50+ rep goal in 5 sets. Use the bulldozer method with 40 second rest periods. Low Incline Barbell or Dumbbell Bench. Achieve a 60+ rep goal in 5 sets. Use the bulldozer method with 30 second rest periods. Seated Cable Row. Achieve a 60+ rep goal in 5 sets. Use the bulldozer method with 30 second rest periods. Cable Tricep Extension superset with Standing Cable Curl. Achieve a 70+ rep goal in 6 sets. Rest 60 to 90 seconds in between supersets. Cable Crunches. Achieve 50+ rep goal in 4 sets. Use the bulldozer method with 30 second rest periods. Straight or Trap Bar Deadlift. Work up to a top set of 5 repetitions – this should NOT be your 5-rep max (5RM). Drop the weight achieve a 20+ rep goal in 3 sets. Use straps or a mixed grip (one hand pronated and one hand supinated) if your grip gives out before your back. Seated Arnold Press. Achieve a 50+ rep goal in 5 sets. Use the bulldozer method with 40 second rest periods. Pull Ups or Lat Pull Down. Achieve a 60+ rep goal in 5 sets. Use the bulldozer method with 30 second rest periods. Close Grip Bench Press superset with Dumbbell Shrugs. Achieve a 40+ rep goal in 4 sets. Rest 60 to 90 seconds in between supersets. Chest Supported Reverse Fly or Reverse Fly Machine. Achieve 60+ rep goal in 5 sets. Use the bulldozer method with 30 second rest periods. Leg Extensions superset with Seated Calf Raises. Achieve a 70+ rep goal in 6 sets. Rest 60 to 90 seconds in between supersets. Are you a runner that successfully balances weightlifting and running? Have you had success running this routine? Let me know in the comments below!